12 Banners designed in 468x60px format and also other sizes you feel will work on message-boards, websites and emails. Can be flash, static or rotation ones. 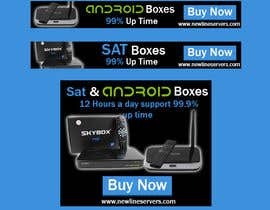 The site url MUST be on the banner and show we sell sat boxes and android based boxes and supply cccam/newcamd information. Our site also supports files, guides, videos and is 100% automatic so the users does need to wait. You can see the site when you go look. graphical background etc is up to the designer. Remember i`m after 12 images MIN and sizes as above. loads removed as a banner with just words is pointless, needs as about to show some info.